Once upon a time, there was a man. This man lived in the Fabled Land of South Florida. Since he was in South Florida, he was subjected to all sorts of conditions. Now, being a rugged, rough and tumble sort of person, this man would go out into those conditions and simply shrug. After all, he had two of the most precious friends in the world. One was a good friend, strong and pure, the other had four legs and was a SuperDog. While the SuperDog did not like to go out into some of those conditions, mostly the ones that included lightning, She did not seem to mind such things as wind and heavy rains. Our Superdog was not completely fearless, but she was also a rugged, rough and tumble sort herself. Our pack of three walked many miles in all conditions. That was their way because those from the land of the City of Brotherly Love have that in their own constitution. They enjoyed being in the great outdoors. The kiss of the sun on their brow, the wisp of the wind lifting their hair and gently placing them back where they belonged, and the occasional cool droplets of rain were all things that they looked forward to and enjoyed with gusto. There was, of course, a minor problem. While the SuperDog was happy to walk through puddles that could have supported aquatic life, the two men did not enjoy it as much. This being South Florida, they had to walk around those puddles or else suffer the indignity of having their shoes turn into buckets and carry water far from where it was placed by Mother Nature. That Mother was a bit of a capricious soul, as we all know. They searched for a solution. First they tried something called Sandals. They did not work since they offered no protection against stones getting under the toes, and that was bad. Then they tried simply wearing older shoes, but the older shoes would wear out quickly and stop being useful. Finally they hit upon a solution of a special footwear that was created to accept and then remove the water from the inside. These special shoes were full of channels to make sure that you did not keep too much water in and create some problems. Life was good. The special shoes kept our heroes comfortable and dry. When through, these shoes could be drained and allowed to dry indoors quickly since there were no fibers known to be natural to man in them. In fact they were a construction made completely of the refined dinosaurs, and thus were older than 65 Million Years in origin! However these sainted footwear had a useful lifespan just like any other artifice. They ended their use by having the sole of the shoe separate in a strip of rubbery material. That was it. But to honor the sacrifices of the long deceased dino-warriors that were reduced to synthetic fabrics to clad our heroes' feet, the shoes were repurposed. 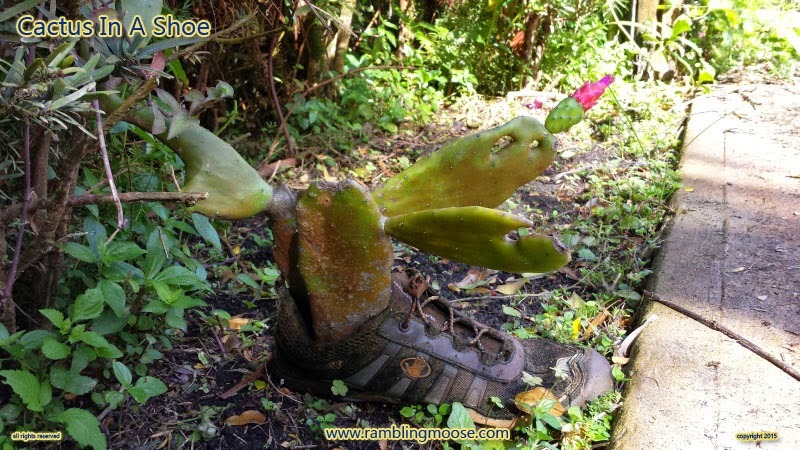 They accepted a bit of soil and a pear from a cactus, since they are everywhere in South Florida and were placed lovingly in a spot in their domain. To this day, the Cactus thrives in their footwear home under the hedges, being kissed by the same rain that the two men and the SuperDog would wait for. Grabbing moisture, and oxygen from the air, and sunlight from the skies, this Cactus would show its gratitude by putting forth a bloom in Spring, it's own contribution to the beauty that is the natural world.